If you’re searching for apartments in New York, prepare to discover some of the most interesting, historical architecture in the world, each with their own unique style and amenities. Whether you are moving to New York just because or to go to school, there is an apartment style to suit your taste. Even if you’re not planning to move to NYC now, you might be after you read this post listing amazing building designs. The San Remo Apartment on 145 and 146 Central Park West is a cooperative luxury apartment with two towers that offer a great view of Central Park. An average apartment has eight rooms with 10 foot ceilings; this is one of the most expensive apartment buildings in New York. The apartment owners are actually shareholders. Steven Spielberg combined two units and Dustin Hoffman combined three. Many units have a large living room, library, kitchen, several bedrooms and a servant’s room. The Majestic at 115 Central Park West is a housing cooperative. Designed in 1930 in the art deco style, the Majestic had 238 apartments and 29 levels. It was modernly simplified and defined a new way for the wealthy to live more humbly. The building of two towers faces Central Park, offering a breathtaking view. The Dakota House at 1 West 72nd Street is a combination of German, gothic, renaissance, and Victorian styles. Constructed with brick and sandstone from 1881-1884, the building resembles a town hall and, at one time, had 65 uniquely designed apartments; no two apartments were the same. The Dakota is the former home of John Lennon and his wife Yoko Ono and director Roman Polanski filmed exterior shots of Rosemary’s Baby there. Each unit has many amenities included and there are community areas like a laundry room, a shared kitchen, pantry, wine cellar, gym, bake shop and garden. 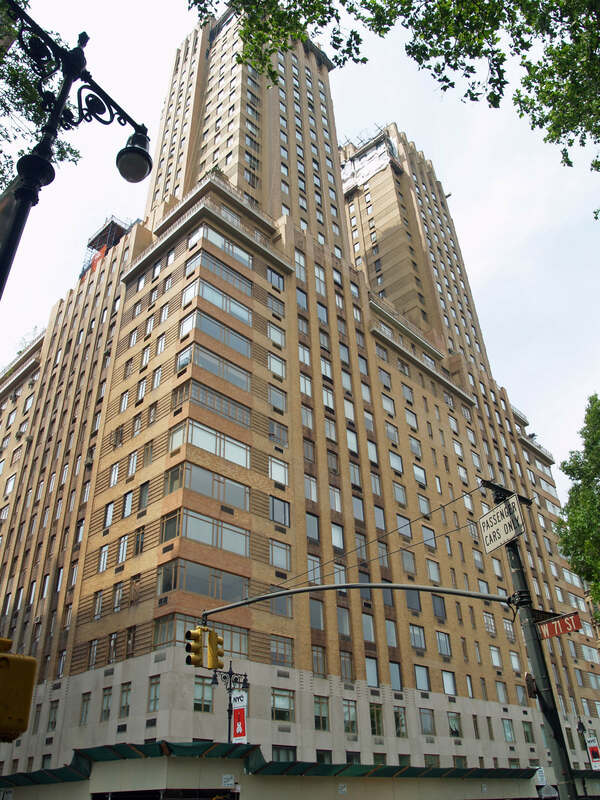 Beresford at 211 Central Park West is a 23-story brick and limestone building with 175 apartments. In the courtyard are a fountain and an Italian Renaissance-styled garden. The building has angels, dolphins, and beasts carved into the stone exterior. Beresford, designed by architect Emery Roth, replaced a hotel in 1929. Perry West at 173 and 176 Perry Street is a modern apartment building, designed in 2002. The towers overlook the Hudson River in the historic West Village. The exterior of the building has clear glass that implements a contemporary look. Each condominium in the towers has a spectacular view. There are steep fees for doormen and cleaning services, but if you’re already a tenant in the building, you’ll be able to afford it. Perry West has a 50-foot pool, a wine cellar, and a fitness room. Trump World Tower at 845 United Nations Plaza is the 48th tallest building in the world, with a breathtaking view of the east river and midtown Manhattan. Each of the 374 apartments has floor-to-ceiling windows, marble bathrooms, and hardwood maple floors. The building includes a large swimming pool, a health club, and in 2006, an Asian fusion restaurant opened in the building. Beekman Tower, at 3 Mitchell Place/First Ave, is 28 stories of orange brick apartments. The art deco-style skyscraper underwent construction from 1927 to 1929 as an apartment building for college-educated women entering the work force. The rooms were rather simple but the shared areas were well-designed and luxurious. Today, it is an esteemed hotel with beautiful rooms and luxury dining. Guests can reside in the hotel for up to a month. Most renters find that New York apartments offer all of the conveniences and the comforts of home for a high price. Still, there are many apartments in New York designed for those seeking a bargain. One may have to look hard to find the right apartment, but the key is to look for a nice design and view. This guest post was written and provided by freelance writer Michael Keagan who is a full time father and part time local real estate, apartments and rentals broker.